Tom Ford TF0237 Snowdon - Custom Need Help? The latest installment of the blockbuster James Bond franchise 'Spectre' hit theatres, and while some might take special notice of the cars, clothes, or gadgets, here at Eyegoodies we are all about the sunglasses. So we couldn't help but spot the world's favorite secret agent, played by Daniel Craig, wearing a Tom Ford frame. 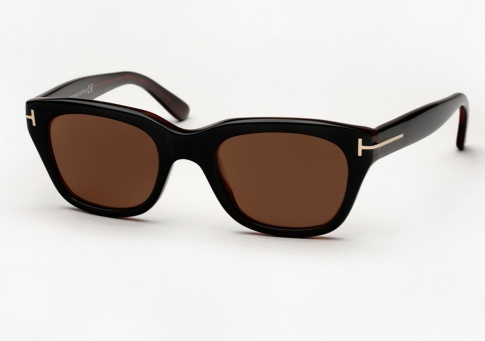 First worn in the funeral scene in Rome, Bond is sporting Tom Ford Snowdon sunglasses. Handmade in Italy, the Snowdon is a classic shape made of thick acetate. There has been some speculation as to the color worn, however after watching the film and speaking with our Tom Ford reps, we can confirm he is wearing the glossy "Black on Dark Tortoise" colorway, however *NOT* with the default grey gradient lenses. He instead is wearing the frame with solid brown lenses (which does not come this way from Tom Ford). So to pay tribute to the film, for a limited time we are offering a Tom Ford Snowdon custom: which is the black on dark tortoise colorway, customized with dark brown lenses. And in the true Bond spirit, the premium lenses are also polarized to eliminate any reflective glare, as we can’t imagine him wearing anything but the best. The Snowdon, is one of the those frames that works well to elevate any wardrobe whether you are taking down an international terror organization in a tux, or taking a casual stroll down the street in a pair of jeans and a tee. Eyegoodies exclusive: Custom brown polarized lenses. Tom Ford logo plate inlaid on both ends.